In the year since I last contributed to The Notebook, I’ve gradually developed my tailoring skills to improve both accuracy and speed. I work under Paolo Nicodemi, and he’s been very good at teaching me to examine each step of the coatmaking process and consider how long it should take. 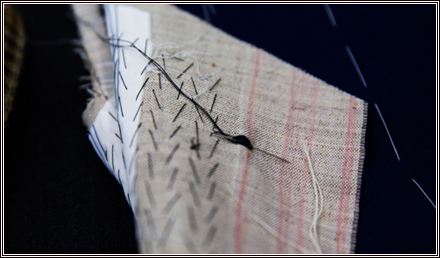 I know that the padding of the lapel for example, as I’m doing in the picture above, should take around 15 minutes. When everything is broken down you can work out why a job is taking longer than usual, and I’ve found in the past year that as a result of that process my work simply flows a lot better. 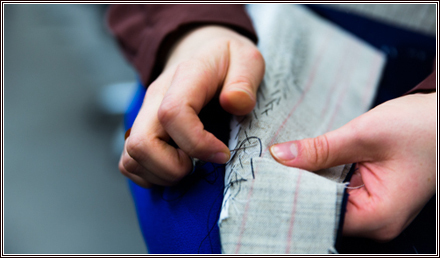 That repetition and concentration makes you more accurate too – you can see that in the regularity of stitches in the lapel or chest. Technical skills that I’ve now mastered include making all the pockets, the sleeves and the side seams – I now do all of those for Paolo. And I’m working towards being able to do a forward fitting entirely myself. Matching checks on the pockets is obviously hard: we match the jacket, flap and the jet. But the key is preparation – as long as you set it up right, cutting everything correctly and laying it out, then it should work. I can see how matching the jet, particularly on a Prince of Wales check, could seem difficult. But as long as you prepare well it’s easy. Having said that, I didn’t think it was easy a year ago! My aim over the next few months is to refine these techniques even further and learn to work with a wider range of cloths. Look out for that update here on The Notebook – hopefully it won’t be another year before I’m back.